Friederike Clever, Untitled, 2008, acrylic on canvas, 78 7/10 x 114 1/5". Friederike Clever pursues a kind of textural realism in her new large-format paintings, which she compares to Gobelins tapestries. This exhibition also includes several smaller canvases that interweave brushstrokes and the materiality of the support in different ways. Clever seems more interested in the translation processes that lead to a given image and are visible in the final product than she is in formal or visual similarities. 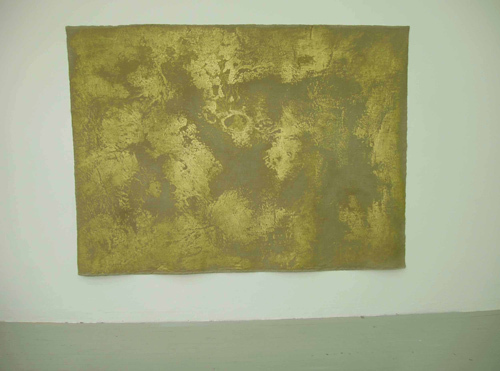 At first glance, two horizontal pictures, both Untitled (all works 2008), appear completely abstract: Clever has unevenly rubbed gold acrylic paint onto raw, unstretched canvas fibers, and the resulting images seem to present a certain pure materiality, somewhere between representative decor and material decadence. Yet these images are representations of translation in a very direct way: By using a frottage technique, Clever has rendered the uneven floor of her studio as the texture of the canvas. This work is realistic in the sense that it is literally identical to what it represents––the images “actually look like an old piece of fabric,” Clever says, and the “representation focuses on substance and texture, and not on surface, like a painted image.” Clever continues to pursue texture in the smaller works, though here painting plays a different role; she again uses raw canvas but stretches it to further emphasize a link to panel painting. One such small work features densely applied paint with variable strokes of red, brown, purple, and pink. Though abstract, the patterned materiality of this image is striking and holds the viewer’s gaze on the surface, as it represents a loosely woven fabric with colors that immediately recall different shades of lipstick. With such dexterity, Clever develops surprising conjunctions of Minimalism, opulence, and ornamental realism in her painting.